A group of astronauts goes on a trip to Mars to investigate what appears to be an abandoned alien spaceship. They're captured and brought underground, where they find a society of humans and aliens called Krsh (yeah, I have no idea how to pronounce that), who seem to be practicing Orthodox Judaism, but accept Jesus as their Messiah. However, they believe that Jesus is a man, not the son of God, oh and by the way he lives in a big orb that is like an underground sun. 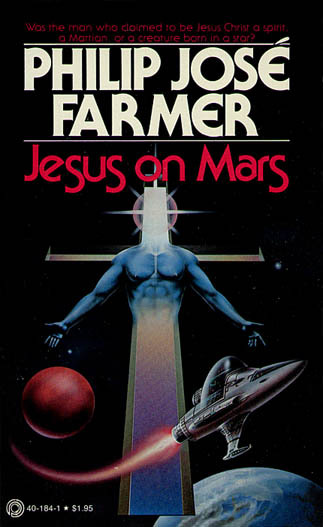 A lot of the story centres around the astronauts trying to decide if the man is really Jesus or not. The reader is also led in various directions on this, so I definitely found myself flip flopping a lot! Sometimes he seemed pretty genuine, but then he'd come out with this crazy plan to take over Earth (but in a friendly way?) and suddenly the egomaniacal alien theory would be looking pretty good again. I liked how the author tried to be pretty progressive for his time. While some offensive sentiments are still expressed, the main character is black, and one of the other astronauts is a feminist. She's also an atheist, and another character is a Muslim. I guess this was probably done to show diverse viewpoints, and it was effective, making the whole story a sort of philosophical debate. 3 stars. A neat idea, but I was bored at times as it sort of dragged on.